A war is brewing between machines and snow, and its battle tactics are being studied—rehearsed, practiced, mapped, rerun, and mastered—in the vast parking lot of New Jersey's MetLife Stadium, home of Super Bowl XLVIII. The New York Times waxed poetic, reporting the scene: "As ballets go, this one was rather mechanical. A cast of front-loaders twirled and turned and performed parking-lot pas de deux with a machine that can melt 600 tons of snow in an hour." They are getting ready, nearly two months ahead of time, to ensure that this season's Super Bowl is free of the horrors of snow. Graceful, operatic, weighing as much as small Transformers, these half-robotic snow-removal machines form a veritable anti-snow army, and the NFL—assisted, of course, by the taxpayer-funded infrastructure of the state—is preparing quite a rollout for the big game. 821 trucks would be ready for snow duty within 30 miles of the stadium and an additional 2,400 trucks could be called in from elsewhere in the state. 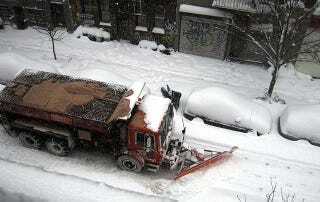 In New York, the officials said, 2,000 garbage trucks that double as plows would be standing by, along with 440 salt spreaders and more than 230 front-loaders. The stadium itself has six plows, 30 front-loaders and 12 trucks to haul snow in addition to the 600-tons-an-hour melter and a couple of smaller ones, and the stadium went through what amounted to a dress rehearsal in the snowy weather last weekend. Brad Mayne, the president and chief executive of the stadium, said crews cleared and melted 5,000 tons of snow from the parking lots. These crawling landscape technicians will thus shape and clear the roads and parking lots of eastern New Jersey, leading into and out of New York, and pushing—plowing, melting—further afield, deep into the football-loving suburbs and to all the airport hotels and train stations these routes are eventually connected to.